Getting married on the mountain side? 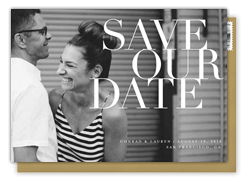 This photo suite features a modern but elegant text overlay template that features your engagement photos. Paired with a little drawing of snowy mountain peaks, this invitation is perfect for the couple tying the knot in the hills.